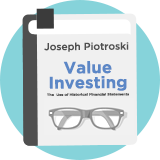 The Piotroski F-Score P/B is the classic value strategy by famous finance academic Joseph Piotroski. Originally published in a 2000 research paper titled "Value Investing: The use of historical financial statement information to separate winners from losers", the strategy hunts for the highest quality shares amongst a deep value basket. In this version of the screen, the cheapest 20% of the market by their Price to Book ratio are first selected, and filtered further to find those with the most improving fundamental health trends using the Piotroski F-Score. Piotroski developed the F-Score system after observing that: "In that mix of bargain companies, you have some that are just stellar. Their performance turns around. People become optimistic about the stock, and it really takes off. However half of the firms languish; continue to perform poorly and eventually delist or enter bankruptcy." Piotroski's back-tests over 20 years showed that his formula could improve the returns from typical value investing strategies by at least 7.5% annually and is especially effective amongst small caps. Investors should beware the low liquidity shares in this screen can be expensive to trade.